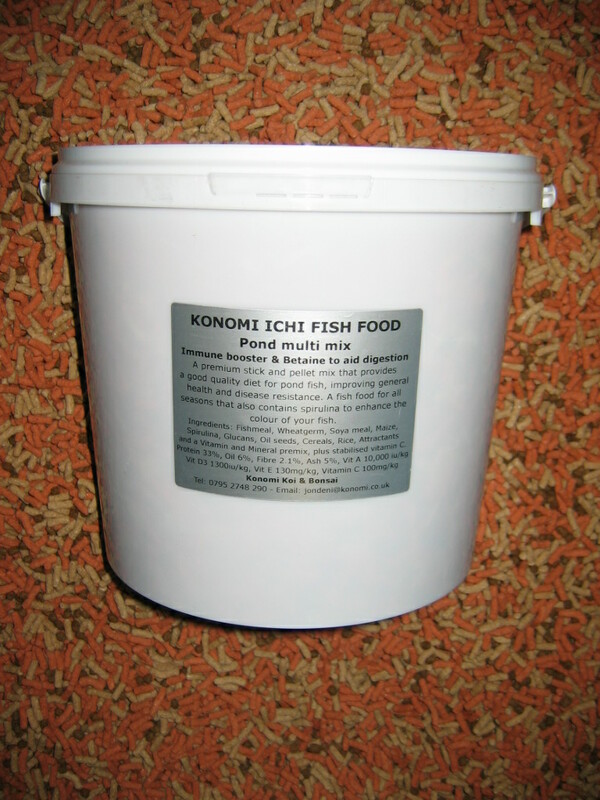 Description: Konomi ichi Pond Multi Mix, 5ltr tub. Konomi ichi pond multi mix is a premium stick and pellet mix, made for the European climate and full of high quality ingredients. It provides a good basic diet for all pond fish, improving general health and disease resistance, and can be fed all year round. Konomi ichi will provide your fish with all the nutrients they need to stay healthy and reach their maximum potential. This high performance pond fish diet also contains spirulina to enhance the colour of your fish. A high quality pond fish food for all seasons. Your fish’s immune system is it's first line of defence against disease! Fishmeal, Wheatgerm, Soya meal, Maize, Spirulina, Glucans, Oil seeds, Cereals, Rice, Attractants and a Vitamin and Mineral premix, plus stabilised vitamin C.
We highly recommend this quality fish food, as all our fish are healthy, colourful and have excellent shape and growth rates. This is a fish food that has been tried, tested and is used by us, and which has received excellent feedback from our nationwide customers. Konomi ichi pond multi mix, sticks & pellets, average contents 2kg, 5ltr tub.